How many times have I heard "Just needed to let the kids burn off some steam"? I can't count how many times I've said it. Course with our boys it's a bit more. It's not just energy they are running off, it's exercising their senses and expanding their minds. It's about accomplishing simple tasks like getting themselves ready to go out the door, following instructions and learning to think for themselves. So what's stopping us when it's wet? Just because it's not actually raining, doesn't mean we won't get wet. Walking through the long grass, jumping and climbing about can lead to wet feet. If Jane gets her feet wet, we might have a bit of moaning. If David gets his feet wet, he doesn't really care. We'll head home, because, it's not the best to have wet feet. But, many kids with autism or sensory processing difficulties struggle with the feeling of 'wet'. If Anthony gets his feet wet, we have to go home straight away. He feels the cold very easily - it's as if it's almost painful. So often, if it's wet, we just won't go out. Then why, not just throw on your wellies? Let's face, many wellington boots aren't very warm. The extra movement inside and Anthony's general need to skip about, like many kids with autism or ADHD do, means his sock constantly ends up rolled around his ankle or more often the middle of his foot. Result - cold, uncomfortable feet. And again due to his sensory needs, Anthony really feels this. Even Jane's a bit unsure about generally wearing wellies. They are a bit more tiring to walk in and she secretly told me she didn't want to put them on one time... in case she fell over. Anthony is generally terrible at walking in wellington boots. His autism, ADHD and hypermobility means he walks a little differently - he's a tiptoe walker. So even at nine years old, he'll still fall over like his younger sister. In traditional wellies, he skips a long on his toes and flops around inside the boot. He gets a bit embarrassed about lagging behind because of it all time. 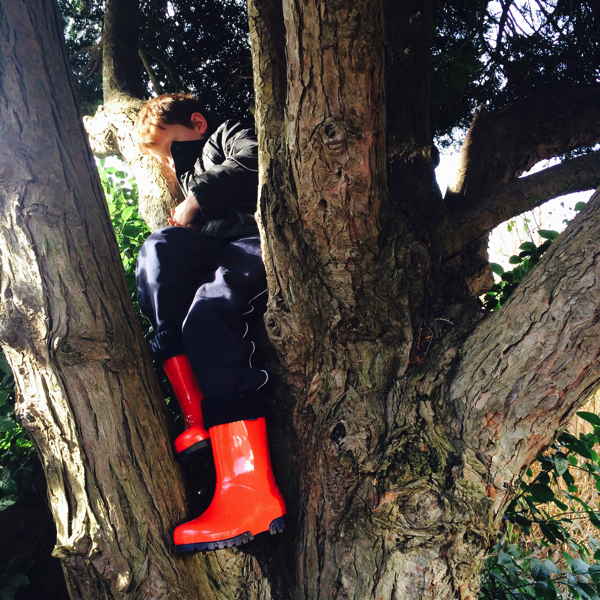 If we went out, he'd often end up wearing his school boots instead, which is not ideal. No splashing in puddles aloud! But going out in the wet is now a bit easier thanks to our wellington boots. Yes, like other wellies they are waterproof, so no more wet feet. They come in a fabulous range of happy colours. We were sent a red pair as red is Anthony's favourite colour and that makes convincing him to put them on a bit easier. But mostly it's because they have this great innovative internal sock design. And that's what attracted me to them. For a start, it helps keeps the kids feet warm. Better than having to put two pairs of socks on their feet (to fall down and get scrunched up). It also helps the boot feel secure. The fabric stops the kids feet slipping around inside the wellies. This means Anthony is less likely to fall over, and he has more control when walking on uneven ground, jumping or climbing over logs. He even wore them to climb into a tree, no problems. And by keeping his feet more secure, it also prevents his socks being pulled down inside the boot. 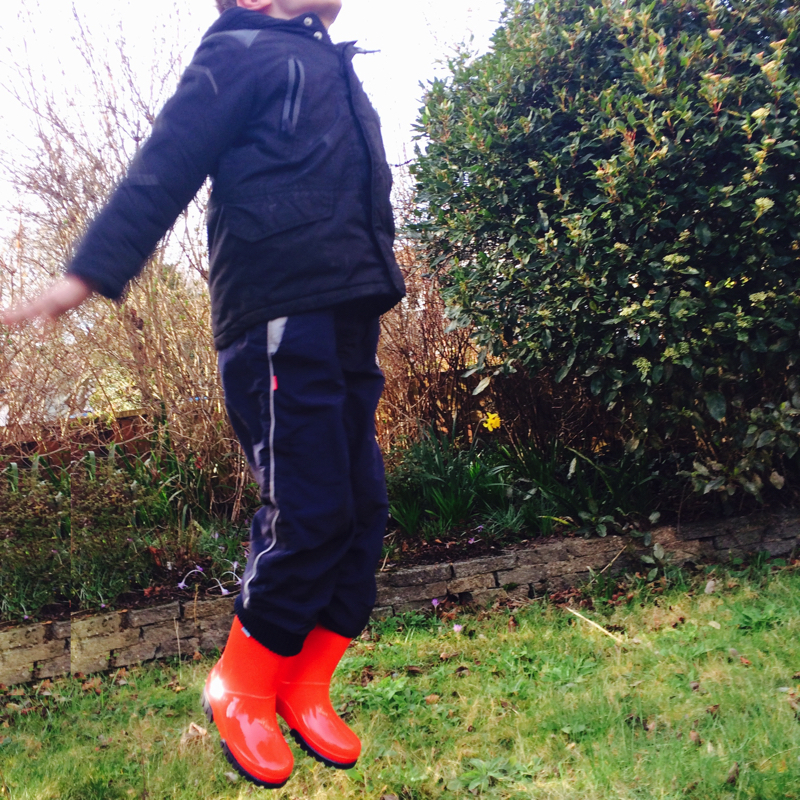 Anthony may even get used to wearing more traditional styles when he needs to, thanks to these wellington boots. Indeed, as he grows, the internal sock can come out and he can try wearing the wellington boots without it. Getting another season out of the boots or for when it's a bit warmer. The brand also have a Superlite version which I think we will also try as it's another way of making walking in wellies a bit easier. Along with good footwear, we've also got to make sure we go out with the correct coat too. If there is any chance of rain, Anthony and Jane cope much better with a hood. Rain in faces, even a slight drizzle (or wind for that matter) is a big no no for our sensitive lot. But, with the right gear, we can still get out, burn off that steam and enjoy a bit of valuable outside time in the park together. Do you get out much when it's wet? We were gifted a set of boots for the purposes of review. As always, all reviews are my honest independent opinion and I will only recommend products I think are great. The boots look great. My kids are older and if it's wet it is an excuse to stay in and watch YouTube! But, when I can get them out they don't mind getting wet and muddy ( I do because I have to wash and clean everything lol). My kids love nothing better than getting their willies on and heading outdoors! these look lovely and warm and a great idea. Wonder if they do them in adult sizes as my husband suffers with chilly feet!! I can't wait until my bab is big enough for wellies and puddles. These look awesome.